In this Martin & Sylvia's Nature School story, "Bugged by Bugs," Martin is inspired by Karl, Daddy's woodsman friend, who does not use bug spray when working in the woods. What's his trick for keeping the bugs at bay? Karl simply ignores them. Martin tries this at Goose-Eye Wilderness School and finds that not being bugged is a lot more challenging than he imagined. We are joined by KC, our media curator, who has a recipe for an all-natural and wonderful-smelling bug repellant. A few years ago I attended a summer wedding in Maine, on a lake. Oh, my! Like Martin, I learned it's not so easy to ignore our little flying friends, especially when you are the maid of honor, standing behind the bride, eyes filled with tears. However, I was free and clear of bites with this wonderful homemade bug repellant. Homemade bug repellant is easy and safe to make. There are no harsh chemicals like in many store-bought ones. 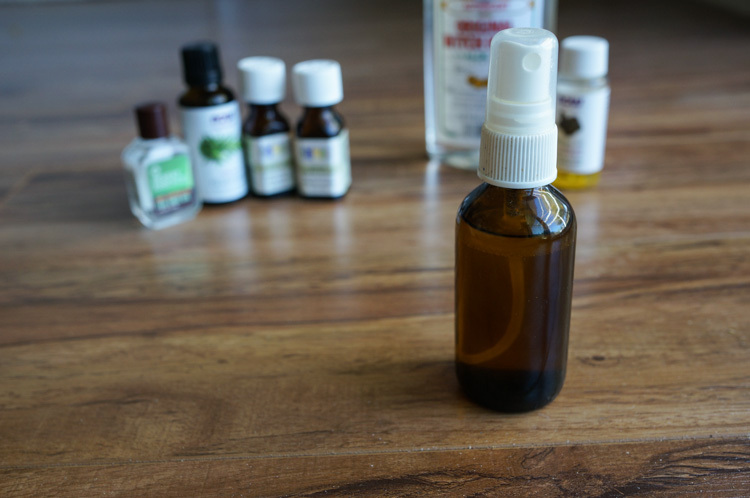 The best part is you can try out different essential oils to see which ones work better to ward off those stinging, bitting insects in your area. Once you have your ingredients gathered, it takes under two minutes to make. Start by filling your spray bottle 3/4 full with witch hazel. Then add 1/2 teaspoon of jojoba oil. The jojoba allows the essential oils to remain on the skin rather than evaporating right away. One by one, add the drops of essential oils to the spray bottle. When you've added the essential oils, close the bottle and shake well to mix. Now you are ready to ward off those bugs and smell amazing in the process.